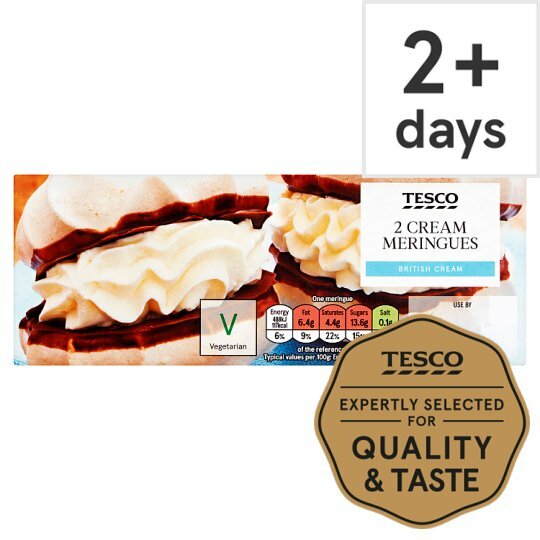 2 Meringues with a chocolate flavoured coating containing plain chocolate, filled with stabilised cream. Carefully baked for a crisp, chewy meringue, filled with whipped cream. Made with British cream. Cream (Milk) (45%), Sugar, Pasteurised Egg White, Plain Chocolate (4.5%), Palm Oil, Dextrose, Fat Reduced Cocoa Powder, Rapeseed Oil, Whey Powder (Milk), Dried Skimmed Milk, Buttermilk Powder (Milk), Stabilisers (Pectin, Tetrasodium Diphosphate, Disodium Phosphate), Sucrose, Emulsifier (Soya Lecithins), Flavouring. Plain Chocolate contains: Sugar, Cocoa Mass, Cocoa Butter, Emulsifier (Soya Lecithins), Flavouring.